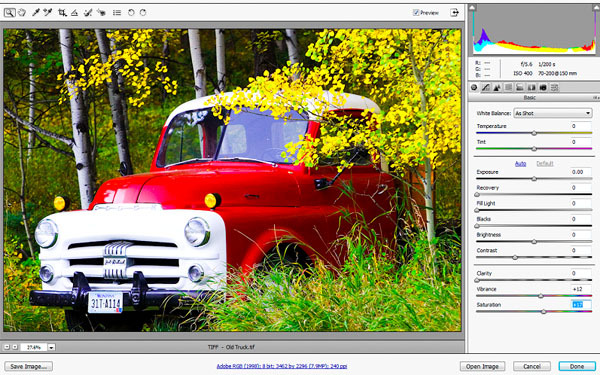 For those of you who may not be familiar with Adobe Camera Raw, as I said earlier you may want to do some more thorough reading on the subject to get familiar with all the ins and outs of the program. 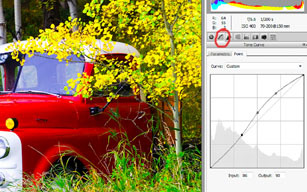 Now Adobe Camera Raw is not the only Raw editing processor out there. There are many others including, DPP, Lightroom,Aperture,Capture One…there a quite a few. But the principles are all going to be the same. We are going to be adjusting our shadow and highlight detail,white balance and many others things. Before I start my editing, I am going to adjust my preferences in ACR, and turn off sharpening. This I do because later we will be doing a special target sharpening in Photoshop. I set any other preferences to my liking and these will take affect from now on when ACR opens. The first thing that I look at is my histogram. Do my highlights need to be adjusted? Do my shadows need to be brought down? Whatever the case I am going to click on the tone curve tab and check the point tab underneath. Now I use my curves adjustments to fine tune the highlights, shadows and midtones in this image. I usually set the highlight and shadow clipping warnings that are located at the top left and right corners of the histogram box. These will let you know when your adjustments or the photo in its current state exceed holding any detail. So after I get my image where I want it, I will look at my white balance and make sure that everything is adjusted properly. This I do by simply adjusting the white balance slider until all looks well. Depending on the photo, I may apply a little saturation, but usually not. A quick tip-if your highlights are blown out a little and your highlight warning is showing clipped areas, try dragging the recovery slider and see if you can recover some of them. Hint-Don’t go to far with this or you will really flatten out your image. I usually keep it below 25. Now this is just a very basic overview of a few of the tools I use when I bring an image in. Every image is different and may require more or fewer adjustments. However this a rough guideline to what is done when I edit an image in ACR. Now I bring the image into Photoshop for the final touches and to save the image in whatever format that is required. This I will do in the next and final part of this series. I know I said it was only gonna be a two parter, but hey what can I say. I would encourage you if you are new to digital or trying to find a concise system on how you operate, to explore all the forums and photography sites you can. There are many fantastic resources out there and some really talented people on the web that are doing some amazing things. A couple sites to check out that have been helpful in explaining this stuff are photo.net & luminous-landscape.com . The forums have both amateurs and pros, with forums that cover just about any subject you can think of. The info being shared is just awesome. Again my purpose of these quick tutorials is to just provide a rough outline of work-flow to help guide you in the direction you may be looking for. One of the areas where I felt lost in the beginning was work-flow and I had a lot of questions like “Am I on the right path here, am I doing this the right way or is there a more efficient way I should be working?” It was extremely helpful in seeing other photographers work-flows. By seeing new tricks and new ways of doing things, it really helped build my effectiveness and efficiency, providing a much more confidence I was on the right path. So that’s it for today, we’ll wrap er up tomorrow.